Anthony is the son of Columbia & Arista recording artist Gino Cunico, born in Sydney, Australia. He is a Singer/Songwriter from Los Angeles California who started singing and performing at a very young age. Anthony has grown up around the Music Industry and became inspired at a very young age by his father. GINO CUNICO was born in Sydney on February 26, 1949. Gino started his professional job in the Australian entertainment industry at the age of 11. In 1967, Gino participated in the band "Executives" with three #1 hits in 1967 and embarked to invade the United States in 1969. In 1974, Gino started his solo artist career. In those days, Gino came across famous Clive Davis, the founder of Arista Records. Therefore, Gino Cunico got a deal with Columbia Records which Clive Davis had been working for at that time. However, when Clive Davis left Columbia Records, Gino also left Columbia Records without releasing any albums there. Once Clive Davis established Arista Records, you can easily understand that Gino signed the contract with Arista Records. Needless to say, Anthony Cunico has been inspired to follow in his fathers footsteps as a Singer/Songwriter and started to write songs at an early age. 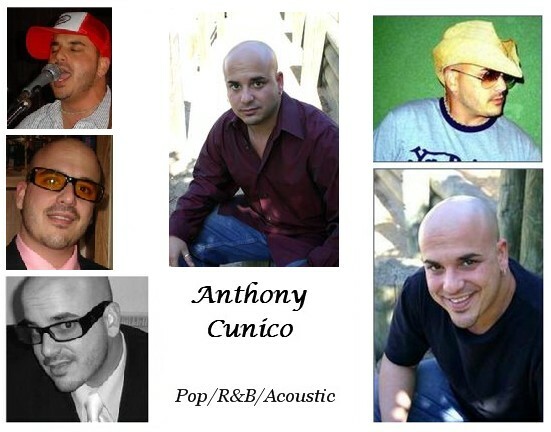 Through the years, Anthony Cunico has had the guidence from his father to become aware of the many aspects of the Music Industry and become successfull not only as a Singer, but as a Songwriter with the potential to take it to the next level either as an Artist or a Songwriter to present Artistic ablility to the Music Industry. When you listen to Anthony Cunico, you will hear emotion and passion in his music and find yourself to identify with him through his music.